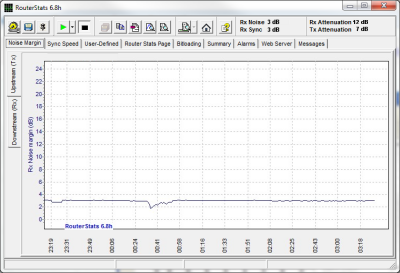 RouterStats was one of the first programs that made it easy to monitor your line stats. Initially designed to work with the Netgear DG834 series, it has since expanded to work with several other routers, although you may need to do some slight configuring yourself. RouterStats can monitor Sync speed, SNR Margin and 2 other user defined graphs of your choice such as attenuation or errors.